There are many advantages to high-speed web hosting - the most important is faster page load times. Your audience may consist of customers, donors and volunteers that visit you on desktop, tablets, and mobile. Ensure that you're minimizing their wait times and delivering an optimized interaction with reduced page load speeds of up to 2X. SSD Hosting is available for as little as $30/mo. Exclusive Offer: New nonprofit customers receive 1st 3 months free. Call us at (612) 204-4921 to take advantage of this exclusive offer. Solid State Drives (SSDs), a type of hard drive that uses no mechanical parts, give you faster read/write speeds, can handle more disk requests and can push through significantly more data than a standard Hard Disk Drive (HDD). WordPress and database driven websites require more server resources than traditional websites and benefit greatly from high-speed SSD web hosting. Need help with web hosting transfer, set-up or email? We're local and can help with just an easy phone call. Byte guarantees you improved speed satisfaction with a 30 day money‐back guarantee. Have A Web Hosting Question? Call us (612) 204-4921 to assist you with selecting a high-speed hosting plan. 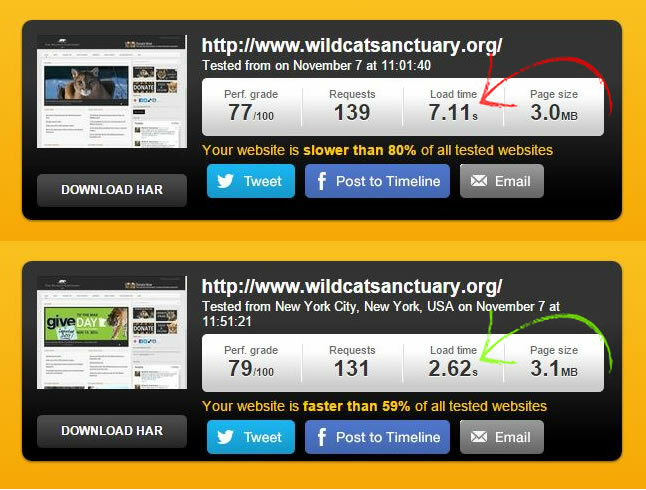 Want to determine how fast or slow your current website load time is? Call (612) 204-4921 to request your free speed test. Pictured to the right is an actual third-party speed test performed prior to switching to Byte's SSD high-speed hosting. Previously, The Wildcat Sanctuary took 7.11 seconds to load. 50 minutes later after the web migration to Byte's hosting was completed, we ran a second speed test which resulted in a drastic reduction of 4.49 seconds to 2.62 seconds. Load time was cut by more than half.